Huge sound and AppTek integration from a portable 1x10 combo. The Ashdown AAA EVO 60-10T is a lightweight and feature packed 60 watt bass combo with a single 10 in. Ashdown speaker. The 60-10T features passive and active inputs, tube emulated overdrive as well as a balanced XLR-DI output and tweeter, making it a very practical combo for rehearsals/small gigs and more. It also comes equipped with an Aux mix level control for the line input, and a headphone out is also provided for silent late night sessions. The AAA-60-10 features a straightforward 3-band EQ to fine tune your tone, but the supplied AppTek cable and socket allows the player to expand the amp’s tonal capabilities. 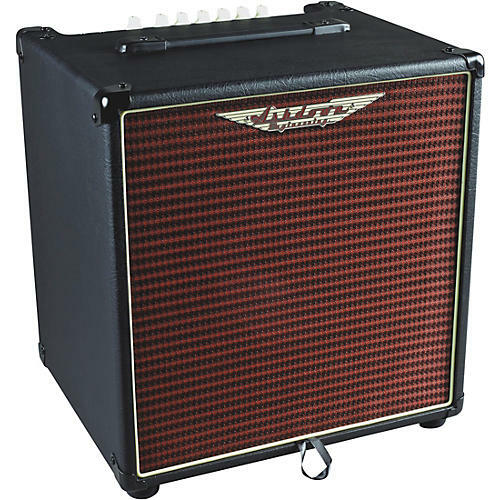 Most prominently, the Ashdown AAA EVO Range has been upgraded to a premium heavy-duty buffalo Tolex covering with a stylish and distinctive vintage red grill. The Ashdown AAA EVO Range maintains its build quality and durability but utilises a new lightweight ply construction that has cut down on the weight but not the tone.